Note that these contextual tabs display only when a chart is selected. If they disappear, select your chart again to view them. Also be aware that depending on your choice of chart type, not all options are available on the Chart Tools tabs. For example, not all chart types have axes, trendlines, and so forth. In addition, some options pertain only to 3-D charts. You can also apply animation effects to your charts, such as having each series fly in separately. The Chart Tools—Design tab, as shown in Figure 1, enables you to change your chart type, edit chart data, and apply chart layouts and styles. Figure 1. The Chart Tools—Design tab is one of three Chart Tools contextual tabs. If you don’t like the way your chart looks and would like to try a different chart type, click the Change Chart Type button on the Chart Tools—Design tab to open the Change Chart Type dialog box. This dialog box is nearly identical to the Insert Chart dialog box. Select a new chart type, and click the OK button to return to your slide. If you make changes to your chart’s design, layout, and format and would like to reuse it again, you can save it as a template. On the Chart Tools—Design tab, click the Save as Template button. Figure 2 shows the Save Chart Template dialog box, which opens. Figure 2. Reuse a common chart format as a template. Verify that the default folder is the Charts folder. 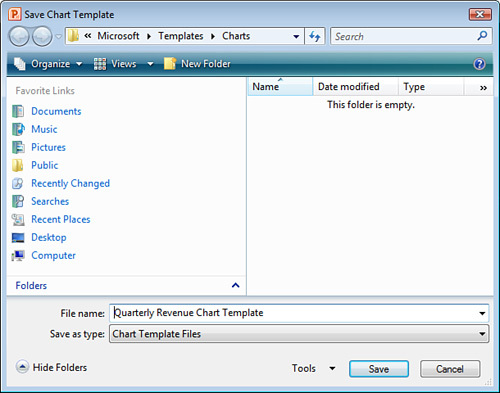 PowerPoint looks for chart templates in this folder when it populates the Templates section in the Insert Chart dialog box. Enter a name for your template in the File Name field. Click the Save button to save your template, and return to your chart. This template now displays as a choice in the Insert Chart dialog box for future use. PowerPoint enables you to edit the data in your charts at any time and refresh data from a linked Excel chart. Switch Rows/Columns— Reverse the x- and y-axes. Select Data— Open the Select Data Source dialog box where you can specify the chart data range and edit series and category labels. Edit Data— Open the Excel worksheet where you can edit your chart data. Refresh Data— Update a PowerPoint chart with data from a linked Excel worksheet. The Chart Layouts group on the Chart Tools—Design tab offers several layout options that you can apply to your chart. Three options display on the tab, but you can click the down arrow to the right of the group to open a gallery of additional options. If you want to quickly dress up your chart, you can apply one of many chart styles designed to complement your presentation’s theme. To do so, select one of the suggested styles in the Chart Styles group on the Chart Tools—Design tab. For more options, click the down arrow to the bottom-right of this group to display a gallery of options in a variety of colors and formats.